Flash Flooding Possible Late Tonight. 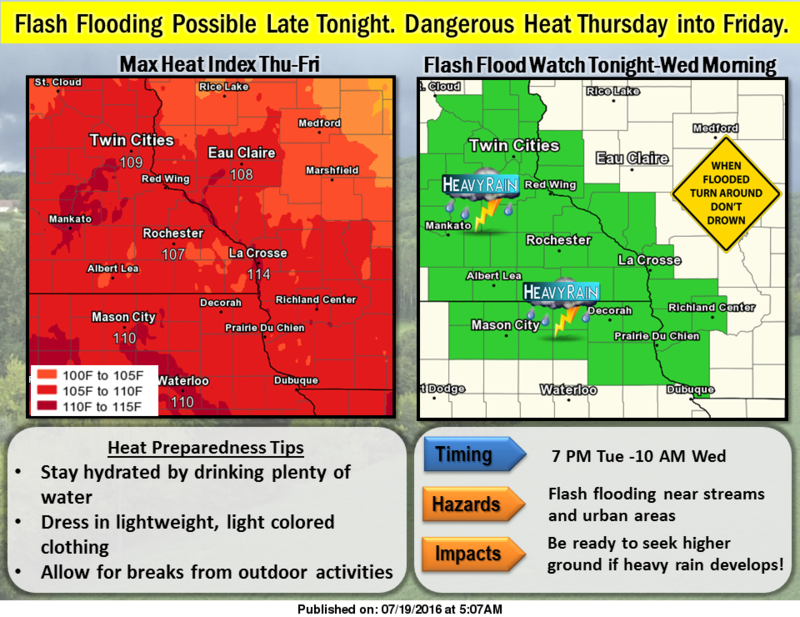 Dangerous Heat Thursday into Friday. Thunderstorms could produce heavy rainfall across parts of the area late tonight into Wednesday morning which may lead to flash flooding. Be prepared to seek higher ground if you are in a flood prone area. Those camping near streams or coulee areas should be alert for rising water levels and possible flash flooding. Hot and humid conditions are expected Thursday into Friday when afternoon heat index values of 100 to 115 are possible. The worst conditions are expected Thursday afternoon. In partnership with Richland County Emergency Management, the National Weather Service will be offering a storm spotter training class at the Richland Center Community Center (1050 N Orange Street) on March 14 from 6:30-8:30pm. This free training opportunity will feature training on recognizing severe weather and how to report it. This interactive multimedia presentation is given by a meteorologist, including various images and video loops from past storms in Minnesota, Iowa, and Wisconsin. (MADISON) – Governor Scott Walker has declared November 10-14, 2014 as Winter Awareness Week in Wisconsin. 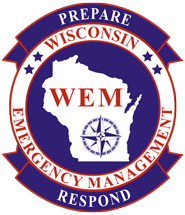 The annual campaign, sponsored by Wisconsin Emergency Management (WEM), its ReadyWisconsin preparedness program and NOAA’s National Weather Service (NWS), is to remind people to be prepared for winter conditions that could threaten their safety. “The number one thing to do: make sure you have an emergency supply kit in your car – it could save your life,” says Brian Satula, Wisconsin Emergency Management Administrator. Winter storms are considered deceptive killers because most deaths are indirectly related to the storm. For example, in the last five years Wisconsin has averaged 18,000 motor vehicle crashes during winter months. On average, 45 people are killed each year and more than 4700 injured on icy or snow-covered roads. Carbon monoxide poisoning is also a danger. According to the Centers for Disease Control, carbon monoxide is the leading cause of accidental poisoning deaths in the United States, with more than 20,000 people visiting the emergency room and nearly 500 killed each year from overexposure to the gas. Now is the time to winterize your car and home, gather items for an emergency kit in your car, and make sure you have a NOAA Weather Radio with fresh batteries. Additional winter weather tips and how to put together a winter emergency kit are available at the ReadyWisconsin website. Residents also can sign up for a chance to win an emergency winter kit. The web address is readywisconsin.wi.gov. In addition, there are numerous winter storm maps and a history of Wisconsin’s winter weather produced by the National Weather Service.